Welcome to yet another recipe in my Just say NO to nuggets campaign! I have been making this one for a while now and was pretty chuffed that Australian Healthy Food Guide published it in 2010 as a reader recipe. This recipe is gluten-free, egg-free and contains protein-packed quinoa and lots of yummy spices. Marinate the chicken strips in buttermilk. I like to leave it overnight as it makes the chicken really moist and tender, but a couple of hours is okay. 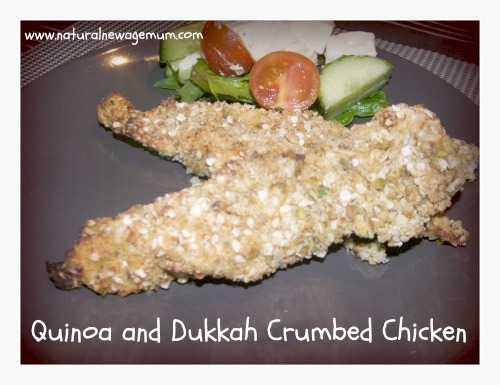 Mix the quinoa flakes, dukkah and Herbamare well and place on a plate. Taking the strips one at a time, slightly wipe off the buttermilk on the side of the bowl. Roll in the quinoa mix, pressing it on firmly. Chuck them onto a tray lined with baking paper and give them a spritz with some oil. Fling them into the oven to cook for about 10 minutes, depending on how big your strips are. Our favourite dipping sauce to serve with this is mango chilli chutney and greek yoghurt. It is lovely served with a huge salad and nice the next day in a wrap with salad for lunch. As always, I love to know if you make one of my recipes, so come back and leave me a comment! Want to make some more healthy, homemade chicken ‘nuggets’? Check out the recipes here.